The following information has be sent in by Derek Cartwright and he would like to hear from anyone with information about the Cartwright’s in this area between 1812 -1841. Does anyone know which public house in Grewelthorpe William was in charge of in 1841. BENJAMIN CARTWRIGHT. Born C.1796. Buried 22.10.1848 Mickley. EDWARD CARTWRIGHT. Born April 1781. Died 19.8.1858.Pickhill. Son of John & Mary Thorpe. Farmer married to Jane Burton. of Watlass. in Pickhill. 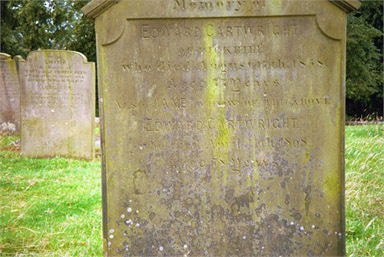 Grave of Edward & Jane Cartwright. Pickhill cemetery. EMILY CARTWRIGHT [NEE ?]. Born C.1862 Grewelthorpe. Married Major Charles Clement John Cartwright. of Edinburgh in 1893. In 1911 they had 4 children. Living in Knottingley Leeds. ISABELLA CARTWRIGHT [nee Burton]. Born 1777 Clifton. Buried 7.11.1864 Grewelthorpe. Wife of William the publican. Widow in 1861 living with daughter Mary Calvert. in Grewelthorpe. JAMES CARTWRIGHT. Born C1789. Died Jan 1780. Son of John & Mary Thorpe. JANE CARTWRIGHT. Born Nov 1789 Mickley. Dau of John & Mary Thorpe. JANE CARTWRIGHT. Born 5.8.1821 Masham. Died C1851. Dau of Edward & Jane Burton. JOHN CARTWRIGHT. Born C1750 Kirklington. Died 12.12.1825 in Mickley. Son of William & Elizabeth West. Married Mary Thorpe. of Kirkby Malzeard in 1775. JOHN CARTWRIGHT. Born 1775 Mickley. Bap 20.8.1775 Kirkby Malzeard. Son of John & Mary Thorpe. MARY CARTWRIGHT. Born 8.5.1787 Mickley. Died 16.3.1792 Mickley. Dau of John & Mary Thorpe. MARY CARTWRIGHT. Born 30.7.1807 Grewelthorpe. Buried 14.5.1880 Grewelthorpe. M.I. Dau of William & Isabella Burton. Wife of Isaiah Calvert, Glazier in 1841. Farmer in Grewelthorpe in 1861. PERSIS CARTWRIGHT. Born 9.2.1784 Mickley. Died 7.12.1794 Mickley. Son of John & Mary Thorpe. PETER CARTWRIGHT. Born August 1791. Died 1868 Leyburn. Son of John & Mary Thorpe. THOMAS CARTWRIGHT. Born 1798 Asenby. Bap 6.7.1798 Kirkby Malzeard. Son of John of Mickley. Husband of Ester Witiker. THOMAS CARTWRIGHT. Born C. 1830 Asenby. Bap 14 March Topcliffe. Son of John of Mickley. 1841 census Shoemakers Apprentice. Grewelthorpe. WILLIAM CARTWRIGHT. Born 1777. Mickley. Bap 25.3.1777 Kirkby Malzeard. Died 1852. Buried 7.10.1852 Grewelthorpe. Son of John & Mary Thorpe. Husband of Isabella Burton. Publican Grewelthorpe. Baines Directory 1822 Victualler Black Swan, Grewelthorpe. [Researcher’s note. I am not aware of a Black Swan in Grewelthorpe. There is one however in Fearby, just a few miles away]. 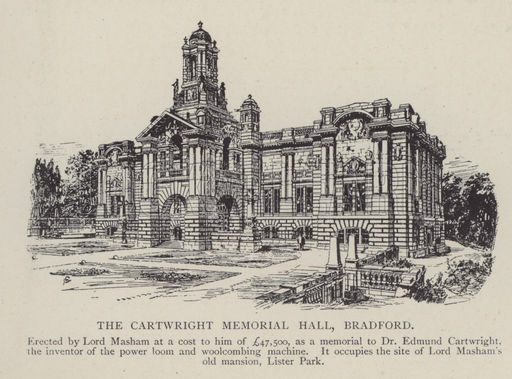 Lord Masham made a donation to Bradford so that the Cartwright Memorial Hall could be built on the site of his former home. Inside is a statue of Edmund Cartwright the inventor of the power loom and the wool combing machine.